In 1976, Atari unveiled the world's first commercial music visualizer designed by Pong creator Bob Brown. The quirky device played what can best be described as psychedelic pixelation. Plug in the box to any TV or audio source, and people could watch the visualizer morph across the screen. Modern visualizers employ specially designed software that captures the data from an audio file. From there it transforms into a graphic with a pre-determined hue and spatial point. The process works in real time to make the music and visual sync up together. Although Atari’s Visualizer never really received a wild welcome, Atari did open the door for modern day visualizers at music festivals, concerts and with today’s music services. Atari may have been the first to introduce commercial music visualization, but German physicist Heinrich Rubens got a jump on the dancing audio phenomenon in 1905. The Pyro Board Rubens Tube uses fire to transform standing sound waves. The flames stay the same height without sound. When sound enters the tube, it affects the amount of gas and the waveform changes and dances. It gives the idea of a fire dance a whole new meaning. After some attempts at music visualization and software launches in the 80s, interest picked up in the 90s. Cthugha was just one of the programs developed and is still used today. Free for PCs and Macs, Cthugha transforms sound input from a CD, stereo or mix into graphics synced to sound. With the help of like-minded software, music visualization has grown in popularity at festivals and raves for a hypnotizing visual complemented with funky B-roll footage from a stock imagery site like Shutterstock. Released in 2008, Pixelmusic 3000 was created by Uncommon Projects for a Make Magazine project. The makers detailed how to create and modify the visualizer for personal use and embrace the world of forgotten technology. Pixelmusic offers tools for anyone to create a music visualizer and see their music dance to the beat. Part game, part visualizer, Audiosurf lets you use your own music to create a graphic experience. The game takes you on a ride where the song you choose dictates how fast you go as well as the shape and mood. Points are earned by grouping together color blocks on the highway and users can compete with each other over the Internet. The iTunes Visualizer launches pulsating graphics that bend and twist along with your music. When the Visualizer is playing, hit the question mark key to see hidden settings to change up the pattern or color scheme. The iTunes Visualizer even works without a song playing if you just enjoy the effects but don’t want to listen to music. Today anyone can enjoy their own music visualizer through the power of a smartphone. Download an app like the appropriately named Music Visualizer to render beautiful effects while listening to your music. Whether you're listening to techno, rap or pop, the visualizer responds and dances to the beat. 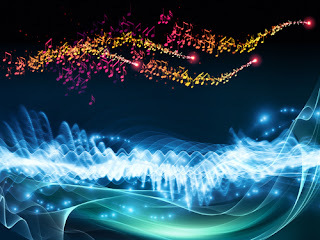 Audio Glow is a customizable music visualizer app that plays pulsating graphics from music or any app on your smartphone. Change up the color, shape and height of the visuals at the touch of your finger.